On the occasion of the centennial of Tibet's proclamation of independence, the Tibetan Youth Association in Europe (TYAE) is approaching Google with an urgent demand: Tibetan places on Google Maps should be labeled in Tibetan script. To stop the disappea r ance of Tibetan cultural heritage, the TYAE is hereby launching the ca m paign forum http://www.tibetonthemap.com . The campaign is being supported by Hollywood actress Yangzom Brauen and Tibetan Associations worldwide. Google Maps is the most important online map service worldwide. Therefore, the TYAE is calling on Google to officially adopt the Tibetan script for the maps alongside the English and Chinese place names. In this way, Google can secure the preservation of Tibetan cultural heritage in the digital sphere. With "Put Tibet Back on the Map", the TYAE is offering a forum for dialogue. Every visitor can support the campaign and help to complete the map. Yangzom Brauen: "A tragic loss for us." Hollywood actress Yangzom Brauen has Tibetan roots. She regrets the disappearance of Tibetan cultural heritage and supports the TYAE demands: "Our language, our script and our culture are disappearing bit by bit. A tragic loss for us and for Buddhist culture." There are already over 600 Tibetan places marked on http://www.tibetonthemap.com. Members of TYAE have labeled the first places in Tibetan - always with the intended goal in mind: Google should put the Tibetan place names on the maps. "There are no precise maps on the internet that are marked in Tibetan. Google could change this. 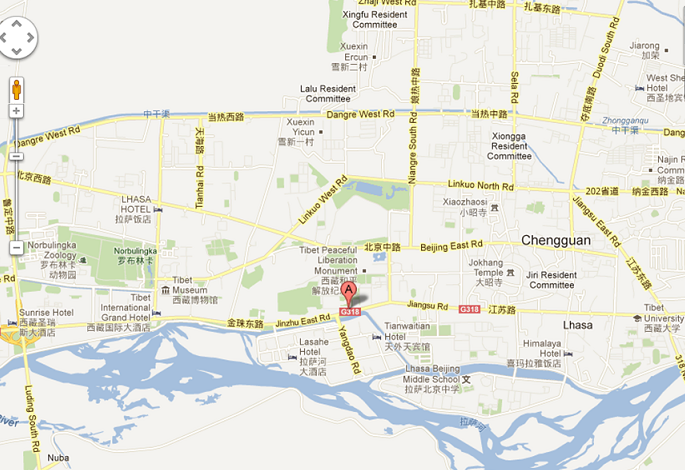 Chinese, Cyrillic and Arabic scripts are already used on Google Maps. Why not Tibetan?" asks Tenzin Kelden Losinger-Namling, President of TYAE.